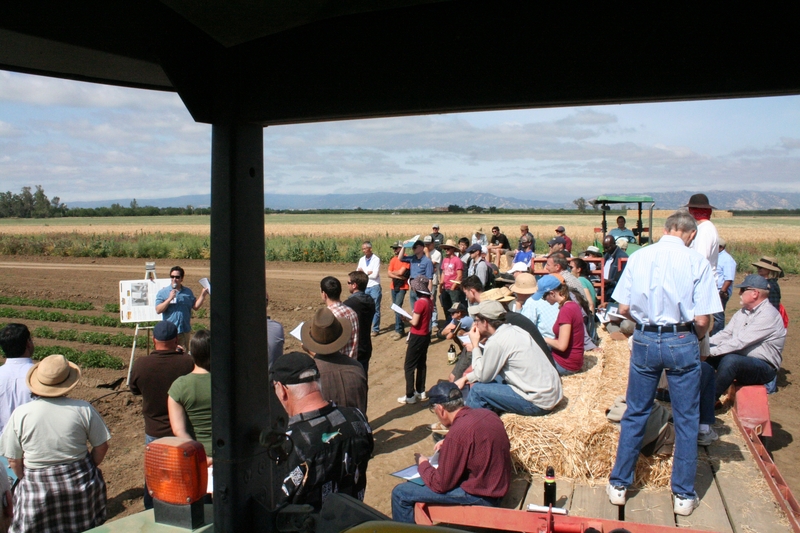 The Russell Ranch Sustainable Agriculture Facility, located near the UC Davis campus, will be holding its annual field day June 8 on the theme of "Farm Water Management in Times of Scarcity." Members of the public are encouraged to attend. 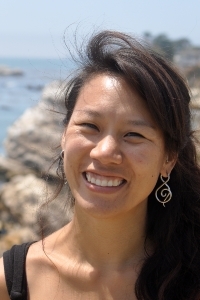 Presenters will explore research, farmers' practices, and commercial products that aim to make California agriculture more resilient in the face of drought, weather extremes, and uncertain water allocations. Presentations from researchers in the morning will be followed by lunch and a panel discussion with area growers. The field day is free for farmers, $5 for students, and $10 for the general public. Russell Ranch is a unique 300-acre facility dedicated to investigating irrigated and dry-land agriculture in a Mediterranean climate. The ranch is run like a commercial farm and features a variety of research activities by UC faculty and UC Agriculture and Natural Resources researchers, with the aim of informing California agricultural practices. Russell Ranch is home to the flagship 100-year Century Experiment, an ongoing mega-experiment focusing on sustainable agricultural practices in California. Since 1994, Russell Ranch has hosted an annual field day to share research findings related to pressing topics in California agriculture. This year's event will focus on a common challenge of farm fields across California: how to ensure healthy crops when the availability of key resources is uncertain. The field day includes tours of Russell Ranch, in-field presentations, panel discussions with growers, and a poster session to learn about the variety of research and outreach on the topic of water management and scarcity. Olivier Jerphagnon, PowWow Energy, Inc.
Stan Knutson, PowWow Energy, Inc.
June 8, 2016, 8 a.m. to 1:30 p.m. Approximately every ten years, the research team at the Russell Ranch Sustainable Agriculture Facility at UC Davis gets the chance to dig deep into their research material to help answer questions about the long-term sustainability of agricultural systems. 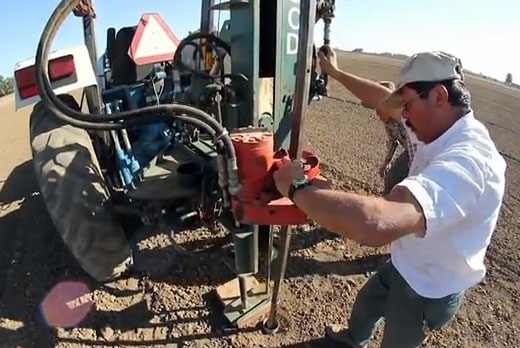 With a steel probe attached to the back of a tractor, the team digs three meters deep to take soil samples at 432 different points around the 72-acre field. The initiative takes the team nearly a month to complete, and the information in each soil core can answer major research questions about the long-term effects of different farming methods on soil health and help inform year-round research efforts at the ranch. “The effort that has gone into collecting this unique set of samples will pay off in figuring out agricultural impacts on processes happening not only in plain sight, but also out of view, buried deep in the soil,” said Russell Ranch director Kate Scow. The sampling effort is part of the Century Project, Russell Ranch’s 100-year-long experiment. The project divides 72 acres of land into individual one-acre plots, with each plot given different treatments throughout the year. Some plots are irrigated; other plots are farmed without added water. Some plots are treated with compost; others are treated with synthetic fertilizer. Each individual plot demonstrates how a combination of different practices can affect crop yield, soil health and the health of surrounding ecosystems. The 10-year sampling is a comprehensive look at the system, meant to serve as a baseline in determining the soil health at Russell Ranch. And there are a lot of factors that influence soil health. The research team tests for changes in soil organic matter, organic nitrogen, phosphorous, and other elemental content. They also test for bulk density (the amount of compaction in the soil), moisture content, and the microbial community at different soil depths. Too, the soil sampling efforts dig deeper in the soil than much research, bringing important new information to soil science. 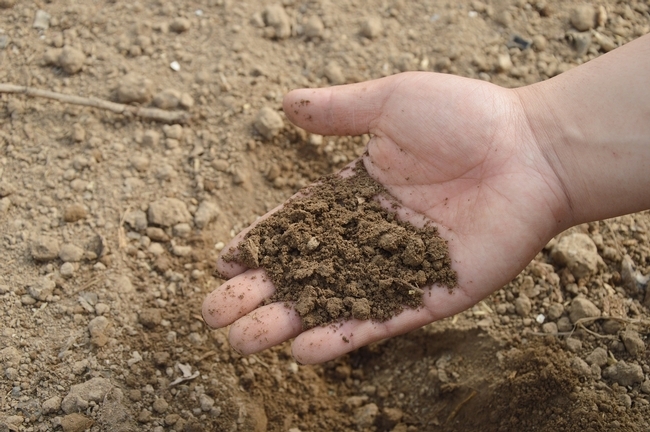 “Historically, much of the research has focused on the top 15 to 30 centimeters of soil. Some previous ideas about the distribution of carbon in the soil and effects of tillage on soil health have been wrong because of this,” said Scow. With the Century Project in its 19th year, the 2012 soil samples are the third out of 11 field-wide samples to be taken over the course of the project. Changes to soil can happen slowly, so a long-term focus allows researchers to update their research as new information and new technologies become available. Taking a soil sample at UC Davis' Russell Ranch.